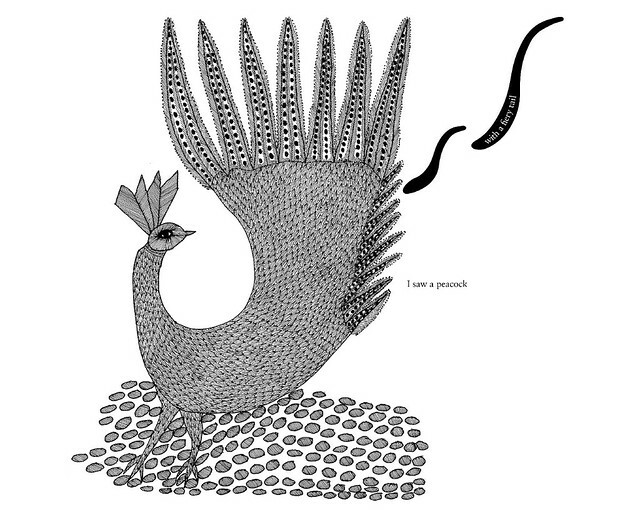 Puzzles are the basis of this 17th century ‘trick’ poem here illustrated by Ramsingh Urveti: I saw a Peacock with a Fiery Tail, published by Chennai’s Tara books. Go to the inspiring BibliOdyssey for more information. Watch the video clips below as these students share their thinking. Again they have burst into the room to discuss this before school ‘officially begins’! I thought I knew that words containing the digraph ‘ue’ came via France. Not so with ‘true’ and ‘rue’ both from Old English. Blue seemed to replace Old English blaw, attested in English from 1300 as bleu, blwe from Old French. (Read a really interesting account of the word blue here in Online Etymology Dictionary). However, ‘venue’ and ‘fatigue’ did enter via France. The Latin root of venue is L.venire ‘to come.’ ‘Venue ‘ is attested from the early 14th century, initially meaning an aggressive arrival: ” a coming for the purpose of attack’ and how this has neutralized and extended to refer to a place or location!Words such as convene- convent and convention; intervene and intervention indicate a twin base element. ‘Fatigue’ is attested first in 1660s as a noun via French fatiguer and a mere thirty years later in the 1690s as a verb. It’s root is Latin fatigare , this root itself perhaps a compound (see Online Etymology Dictionary). Students had spotted fatigable, fatigability last night in the Mac Dictionary, variant forms of fatiguable. An earlier word , now obsolete, fatigate was attested in 1471 (OED) and used by Shakespeare in Coriolanus in 1623:’His doubled spirit Requickened what in flesh was fatigate.’ (OED). Surely, we all feel- even the skeptical Valentina, this provides evidence that we have found a suffix previously unknown to us. An interesting morning’s work – none of it conducted in the official school work time! Try this: What do dictionaries, kings who give up power and someone like Hitler have in common? And student confidence, speed and volubility rises!!! : What links cordiality, bravery and hearts ? Normally quieter students are leaping to explain! How do a chilli, despicable behavior and an inspector connect? How do nasturtiums and torches link?